Nothing is better than a delicious cup of warm or hot coffee in the morning. What if you want to head to the golf course early in the AM and do not have time to sit and sip your fresh cup? Well, this is why geniuses invented travel mugs. Nowadays these products are made of some of the strongest, quality, and most innovative materials and technology in the industry. Therefore, we are eager to bring to our audience the best of the best from this industry for a game of golf. Whether you want double insulation, triple insulation, a matte exterior, or an overall quality design that keeps your coffee cold for hours, the list below will offer a product that will surpass all your expectations. Let’s begin! Nothing is better than a delicious cup of warm coffee on a cold day. Well, we can enhance this moment by adding drinking a cup on a cold day while on the golf course. If you are seeking a quality travel mug for those days on the golf course where you want to take your coffee with you and keep it warm too, we have a great quality product for you. 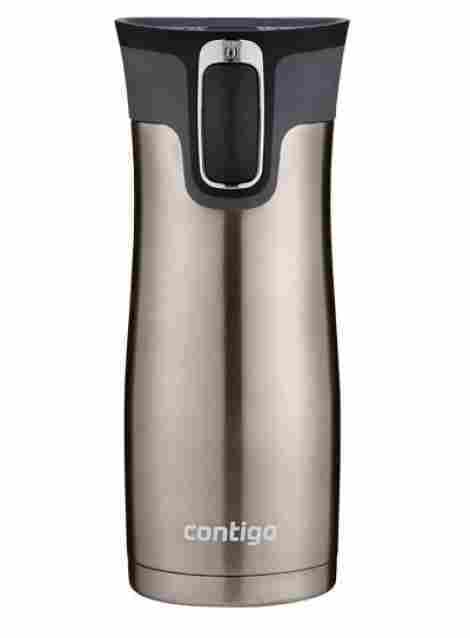 This is the Contigo AutoSeal West Loop Vacuum and here are the two best features. This product is designed with a unique technology that allows the particular product to not leak or spill. If you accidentally drop your mug or it falls while on the golf course, it will not spill. It has a vacuum sealed technology that is AutoSeal and works very well. The design is intended so individuals can keep their coffee warm and not worry about potential accidents on the course. This product comes with ThermaLock design. This design is a locking mechanism that ensures that the lid while stays on tight when you lock it. It does have a one-handed locking design and drinking design. So all you have to do is push the button, drink, enjoy, and get back into the game. This product is very high quality, comes in a variety of very cool colors, and it has four different sizes to choose from. So, whether you want to make your own at-home grande, venti, or jumbo, you can. This is a quality product that is designed from durable materials and it has quality reviews. Now, for the shocking park! This product has over 19k reviews online, making it one of the most famous mugs online! Quality product that is extremely durable. Spill proof and leak proof design. Keeps your drink warm for hours. Diameter may be too large for certain cup holders. May be slippery if wet. This next product comes in a stealthy and cool design alongside a smoky and matt grip finish to avoid any slips when wet. 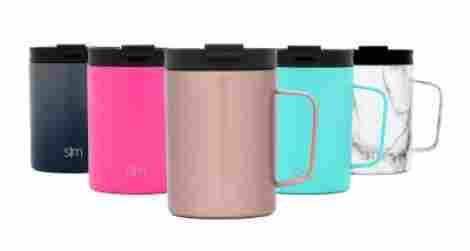 The Zojirushi SM-KHE48AG Stainless Steel Mug is a quality and durable mug that is designed to last, designed to be high quality, and great for on the go individuals. Also, it is a quality insulated mug for the golf course. Whether you want to carry coffee or water, we recommend this product for two reasons. Whether you want a hot coffee or a cold coffee, this product makes it very easy for you to enjoy your favorite drink. With the wide mouth design, an individual can easily take big gulps or delicious sips out of this mug. The wide mouth design also makes it easy for a user to be able to add ice cubes into the mug for quality use. The design of this product is very compact and it takes up minimal space. Overall, an individual can easily add it to their golf stand bag or carry it with one hand. It does come in two different sizes to choose from so users have a variety to think about. Overall, the design is high quality, durable, and effective. To discuss cost and value for this product, we want to share with our audience that this is a very high quality and simple product. The design is durable, it is easy to hold, and the color is an anti-scratch finish that is also anti-slip and allows for great grip when using it. To add to this, the interior is a sanitary stainless steel interior that is very easy to clean. Wide mouth accommodates full size cubes. The rubber part retains flavor and needs to be washed thoroughly. This next product may be one of the most touted travel mugs in the industry. The HydroFlask coffee mug and water bottle have gotten a lot of attention for being a premium quality product with plenty of features and benefits. Alongside the BPA free design and the plenty of color choices to chose from, here are two different benefits that users love about this product. This item is designed with a double wall technology that allows for water or coffee to stay cold up to 24 hours. With this, the double wall design allows for the product to stay warm for up to 6 hours at a time. The stainless steel is an 18/8 premium grade stainless steel that is BPA free and made for high-end quality sports bottles. The design of this product is powder-coated. Meaning, an individual never has to worry about it slipping. In fact, since it is double-wall sealed, it rarely condensates or sweats. With this, the powder technology causes the product to be slip-resistant and very easy to hold for long periods at a time. This brand also has a lifetime warranty with their products and excellent customer service. As far as the price, it can be a bit costly depending on the size that you get. There are three different sizes and the overall technology and design make this one of the highest quality materials in the industry. To add to this, the design is high quality, thorough and very durable. Also, it comes with a variety of colors to choose from and about 5% of the earnings go to a charity of your choice! Durable design that keeps drinks cold for long period at a time. BPA free sport bottle design. Over 5k reviews at 4.5 stars. The lid can be a bit tricky. The flip top may leak. The next mug on our list is made for convenient use and it is a high-quality mug that resembles the traditionally insulated mugs we have come to love. 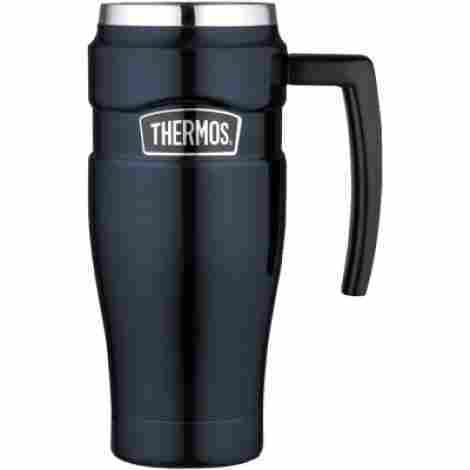 This is the Thermos Stainless Steel King 16 Ounce Mug and it comes in a durable and high-quality design that is leak-proof and convenient. Here is the first feature of this excellent mug if you are waning your coffee warm and easy to drink. It’s the simple things in life! This product comes with a handle for easy drinking. 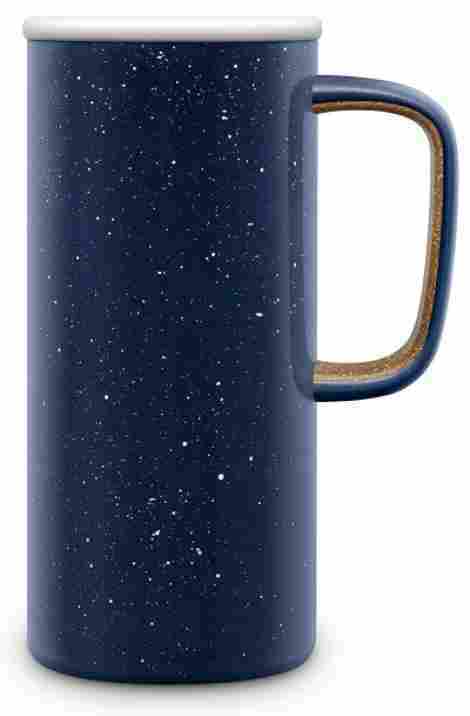 Since it is designed specifically for tea or coffee drinkers, this product is designed to resemble a mug and therefore, the handle is a high quality, slip-resistant handle that is durable, secured tightly and virtually scratch-proof and break-resistant. The design of this mug is a high-quality stainless-steel interior and exterior with a leak-proof lid. To add to the quality of the product, the overall design is also condensation-free and allows for an individual to hold it for long periods at a time without worry about the condensation or slipping. Alongside this, the design is easy to hold, ergonomic, and the fact that it comes with a handle allows for the user to hold it easily. As far as the price, this product is so far the most costly on our list because of the design and the quality of the product. To add to this, individuals can expect this product to be durable, efficient, and convenient. It comes in five classic design colors, red, blue, black, silver, and midnight blue. Overall, if you want a quality and convenient mug that is easy to hold, but with the efficient and benefit of the insulation and travel design, this is it. Insulated design and durable stainless-steel interior. The handle may be too skinny for large hands. Time to talk about a quality tumbler design that comes with many benefits and a beautiful color selection. If you like pastel colors, this may be the tumbler for you. It does not come with a handle, but it does come with many other benefits that are high quality, durable, and well design. 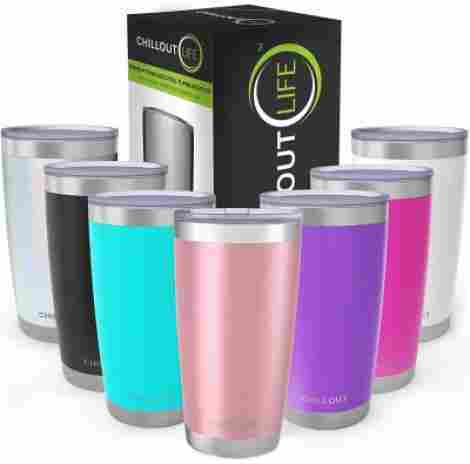 This is the Chillout Life Stainless Steel Tumbler and here is the first benefit of this coffee mug. The design of this product is a sweat-free technology that is durable and high quality. The technology is due to a quality insulation design alongside a vacuum sealed double wall technology. With that, the exterior is a matt slip-resistant finish. Overall, it comes with a variety of color choices and sizes to choose from, making it a durable and quality product to consider if you like the design and color choices available. This product is designed with a BPA-free and completely eco-friendly construction quality. The design is made to be green and flavor free. Essentially, this product does not have that nasty stainless-steel flavor that many other tumblers or bottles have. Due to the design, the brand guarantees a 100% satisfaction guarantee. Overall, an individual is guaranteed a premium construction. To discuss the cost and the value, an individual will notice that this product is priced fairly affordable. Reason being is that the design is very high quality and simple. To add to this, the color choices of this product are very stylish and modern, making it a great product for the hip golfer. It comes in three sizes and the design is made to be premium and the brand guarantees maximum quality. Splash free design and lid. Hot for long periods at a time. Sweat free design and vacuum insulated technology. 100% green and BPA free. Trusted brand with 4.5 stars. We have come to the middle of our list, product number five, and as the next coffee tumbler, it is time to discuss the Hommit 20 oz Coffee Tumbler and a couple of features to consider of this excellent product and design. This item comes with various cool benefits and three different sizes to choose from. Overall, the construction and the quality is excellent. The construction of this product has an upgraded lid design that is made of silicone and happens to be waterproof. The design ensures that the product is sliding and slip resistant alongside shatterproof. In fact, the crystal clear lid is waterproof and made from BPA free construction to ensure maximum quality and design benefits. The bottom design of this product is a standard size design that is convenient and fits almost all standard cup holders. The design gets more narrow towards the bottom to easily fit inside any cup holder, including that of your golf cart. Overall the design is convenient, durable, and constructed to last a long time. As far as the value, this product comes with plenty of positive benefits and a 1.3k rating and 4.5 stars. With that, the design is convenient, durable, and constructed to last. It also comes in three different sizes and with a quality lifetime durability guarantee. To add to this, individuals will appreciate the convenient carry design with the slip-resistant exterior coating. Clear BPA free cover that is shatterproof. May have an odd taste. Needs to be washed multiple times to remove metallic taste. This next brand is one of the leading brands in creating some of the most durable and high-quality travel gear products. Everything from their coolers to their camping gear, they have mastered the art of durability and quality. 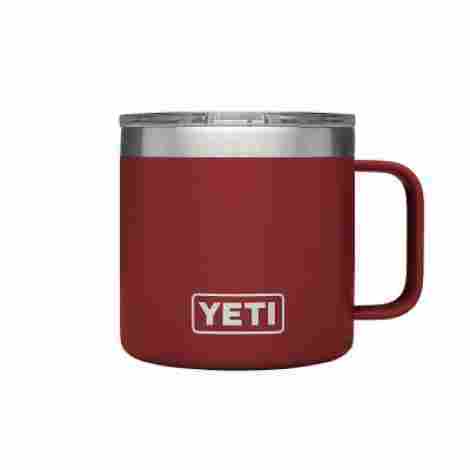 This is the Yeti Rambler Stainless Steel Mug and it is time to share two features of this high end and durable travel mug. If you are familiar with this brand than you know that their products have been known as some of the toughest in the industry. Their high-quality products are over-engineered for camping and travel so individuals can rely on and expect maximum quality. With this, the overall design is dura-coated for no scratching, fading, or peeling, and the quality construction is virtually indestructible. This product is also created with a no sweat design that guarantees maximum quality comfort and durability when wearing it. However, it is the full-loop handle that ensures maximum comfort when using it. Therefore, while on the golf course, an individual feels like they are sipping out of an actual mug, bringing the comforts of home, onto the course. As far as the cost and the value, an individual is guaranteed a durable construction with a masterful and high-quality design. More so, this happens to be one of the most trusted brands in the industry as far as quality and design benefits. The no-leak construction alongside the high-quality durability ensures maximum quality efficiency and construction. For the price, it is kind of small, but you are getting one of the toughest products available. High quality brand with years of experience. Comfortable design for wider hands. May be a bit too wide for some cup holders. Does not keep coffee hot very long. If you love the quality of the last mug, the loop handle, and the overall durability, you will love this one even more. With a more efficient price and a bigger construction quality, this product is efficient, high quality, and durable. This is the Ello Campy Vacuum Insulated Stainless Steel Travel Mug and here are two features of this first-rate and sturdy product. The overall structure and design of this product are a vacuum insulated and stainless-steel design that keeps beverages cold and hot for a long period at a time. With that said, the product design is made to be a 100% leak-proof construction with an easy slider lid for easy open and easy close. Overall, it’s the quality design and resembles an actual tall mug that makes this product excellent. This product has a very unique and quality aesthetic design. This item blends the modern amenities and comfort of a vacuum insulated mug with the vintage aesthetic design of a camp cup. With that, it comes in five different washed out camp-cup looks that are very high quality. Most efficiently, the design is completely BPA-free and the lid is dishwasher safe. When discussing the price of this product, we see this as a very high quality and simple design that is durable and effective. Overall, individuals will find that this particular mug is well designed and constructed to be durable and efficient. As far as the construction, individuals can expect that the design is dishwasher safe, BPA-free, and 100% leak proof. For the price, you are getting a large mug design that normally is double the price. Lid is dishwasher safe and BPA free. The lid may wear overtime. The next coffee mug on our list is made for users that want a modern coffee mug on the golf course. With a wide variety of color choices available, this product is designed for individuals that want a quality stainless steel design that is made to last. This product happens to be vacuum insulated and designed with a quality lid. 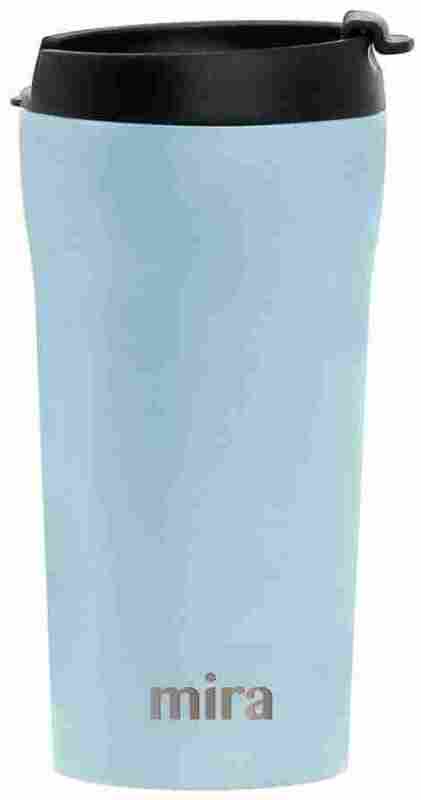 Overall, the Simple Modern Coffee Mug Tumbler is a quality product for individuals that want durability and quality. The design of this product has a quality lid that is made to be internally threaded and insulated to be completely leakproof. With this, the flip lid is very easy to use, remove, and wash due to the quality design. The lid itself is also dishwasher safe and perfect for coffees and teas without having much of that odd metallic or plastic flavor that some products have at first. The design of this product has a premium copper insulation design that is intended to easily distribute heat and cold evenly. More so, the exterior of the inner wall is vacuum sealed and coated to add additional insulation and quality. With that in mind, individuals can expect that the drinks will stay cold for hours. To discuss the value and cost for this mug, we first must make known that it comes in three different sizes. Therefore, individuals have plenty of variety to choose from. It also comes in very high quality and modern colors as well. Now, the design is simple, well-constructed, and they happen to have 4.5 stars and plenty of positive reviews to consider. Flip lid included and easy to wash. Very beautiful colors to choose from. May be a bit too thin. Better to hand wash users have mentioned. As the last mug, this brand is one of the expert leading brands in products such as this. They have designed an incredibly large selection of products to choose from and their experience ranges from quality vacuum insulated designs to stainless steel designs that are highly durable. This is the Mira Stainless Steel Insulated Travel Car Mug and below are two features as to why it is so high quality. This product is made to be durable and compact. In fact, the overall design is convenient enough that it can be placed directly under a Keurig machine and individuals can pour their coffee directly into the cup. Also, it is easy to hold and has a sandy coating that is slip-resistant and sweat resistant. To add to this, the design is convenient and durable. This item comes with a unique lid top design that is high quality and simple to use. The convenience of this lid-lock technology is that the lid cover opens all the way back and locks into place, making it easy for a user to be able to easily unlock the product and sip their coffee. Also, the lid is durable, has no metal or plastic flavor, and the design is convenient and machine washable. This product is priced to be very affordable and high quality. To add to this, the design is simple and convenient, and the construction is durable and easy to hold. This is perfect for cold days on the golf course or days where you want to take a warm cup of coffee with you. They are constructed to be very durable, and the overall design is triple-wall vacuum sealed and very efficient. Trusted brand with plenty of quality products. Easy to hold and sleek. May not keep coffee hot for a long time. Which of these is the one for you? Whether you are a fan of Mira or Yeti, these products are made with customer satisfaction in mind. The most important aspect is that they keep your coffee hot and your water cold. However, many brands go above and beyond to create a luxury travel product that allows for a user to bring their fresh brewed home coffee with them. Now, if you want to know what goes into the masterful creation, it is time for us to discuss the criteria used in the evaluation. As the criteria for selecting and sifting through the best travel mugs and tumblers, we must say that there is an incredibly large supply of different brands and products out there. Therefore, we had to follow a strict guideline to ensure that all of the products and tumblers we shared were of the best value. With that said, our primary intention was to share quality products that were designed to keep your coffee hot. Therefore, that base is covered! Users want there coffee hot and these tumblers are designed for that. However, there are other factors we had to keep in mind when selecting our best quality travel mugs and tumblers. As the first criteria, to narrow down our search, we focused on products that had four-star ratings and above. With that, all of the products we shared had 4.5 stars and above and plenty of positive reviews to consider. The reason being is that identifying the many different positive reviews allows for users to know a bit about the product and how it works before purchasing it. Most importantly, many of the products we shared were designed for quality and designed to last, with many of them having a warranty or lifetime guarantee. This is where we get into the specifics of different important factors that we wanted to consider when selecting a specific travel mug or tumbler. Here are the following features and benefits that we took into consideration when selecting a specific travel mug or tumbler. The exterior coating was definitely an important factor for us. The reason is that we wanted to look at products and take products into consideration that were designed to be slip-resistant. Many of the products we shared were designed with matt or glossy coating which create an anti-scratch and anti-slip coating that allows for the product to have a better grip. As the next criteria, the interior insulation was another important factor because we wanted to ensure each product was designed with proper insulation. What we discovered is that many of them have a double wall or triple wall technology, which is designed to minimize and remove the transfer of heat from your hand to the cup of the transfer of heat from the cup to your hand, allowing liquids to stay cooler or hotter for longer periods at a time. Of course, the lid was another important factor to consider. The reason being was because we wanted to make sure that each product was made to be durable and easy to use. Many lids are designed to be leak-proof and also machine washable, which is a very great benefit to consider. Many lids also have lid-lock mechanisms, which allow for the product to easily lock into place. This next feature is more of a feature that depends on the individual and what they desire. Therefore, we wanted to appeal to different readers and share two varieties. Essentially, there is two type of coffee mugs and tumblers; ones with handles and ones without handles. With that, our priority was to ensure that if they had handles, they were very well designed and if not, that the product would be an anti-slip design, making it easy to hold. As the last feature that we wanted to focus on, we wanted to ensure a wide variety of sizes of tumblers and mugs. With that, there is a wide variety of different sizes ranging from small and wide mugs to tall mugs that resemble the Venti size from Starbucks. Whether you want a more intimate mug or a mug that is designed for a delicious and small cup of coffee, this list has it all. Now, the last factor that is important to consider is the cost of the mugs. Since there are so many different mugs in the industry to consider, it is important to note that the cost will be determined by the quality of the product, the brand, and the overall size and features. With that, it is important to consider that the cost is also due to the strength and durability of the product, with many of the mugs we shared being incredibly durable and made of some of the best grade materials available today. Now that we have discussed these factors in choosing an excellent quality and durable travel mug for the golf course, we want to answer some of the most common questions that individuals have about these products. These questions are both important to note and can help an individual determine the best product to choose. Q: Can you dishwash the product? A: This is a very tricky question to answer because it is dependent on some of the material designs of the product. Most lids are made of a quality BPA free plastic and they can be machine washed. However, stainless steel and the grade of the many of the travel mugs cannot be washed in the dishwasher. Q: Can you microwave the mug or tumbler? A: Once again, this all depends on the strength and intensity of the material. Most commonly you can if it is made of a specific microwaveable safe material. However, the plastic lid and stainless steel cannot be microwaved. Q: How do you wash the interior? A: Hand wash with soap and water will do. Make sure that you properly washed all of the crevices of the travel mug and the lid to ensure that all of the coffee flavor and scent is gone. Q: My mug smells like steel, why? A: This is very common when it comes to travel mugs and tumblers that are shipped with the lid on. The scent accumulates inside of the container because it is so new. With that in mind, always wash the mug and tumbler at least once or twice before using it. Q: Does the product leak? A: It only will leak if it has a single wall design. However, most products have a double wall technology and an exterior coating that is designed to prevent slipping or sweating of the material.